Recently National Geographic has published photos from one of the most dramatic dinosaur fossils ever found, an unidentified nodosaur. What are nodosaurs? They are a family of dinosaurs closely related to the more well-known ankylosaurs, sharing the same basic body plan that resembles a four-legged armored tank, but lacking the club tail that distinguishes ankylosaurs. One of the best known nodosaurs is a dinosaur called Gastonia. Nodosaurs have recently been in the news, as just last month National Geographic unveiled a dinosaur that is among the most well-preserved ever found. An as-yet-unnamed nodosaur was discovered by an employee of the Suncor corporation while working in the oil sands of Alberta. The find was unusual for several reasons. First, the area it was found was a marine environment during the Cretaceous, and all the fossils found there previously were marine creatures. Second, the front half of the dinosaur was spectacularly preserved and fully articulated. That amazing fossil recently went on display at the great Royal Tyrrell Museum in Drumheller, Alberta. Fabulous nodosaur fossil from Alberta. Photo credit: Robert Clark, National Geographic. 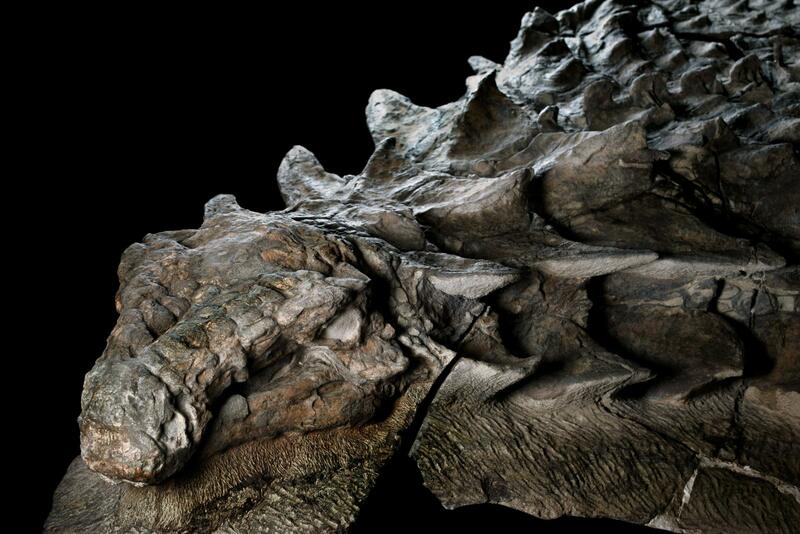 Of the nodosaur family, one of the best known members is Gastonia. Although there are quite a few different members of the nodosaurine family, many of the fossils are quite rare and mostly incomplete. Gastonia is one of the exceptions, with several fairly complete skeletons and close to a dozen skulls which is extraordinary for this group of dinosaurs. The first Gastonia fossils were found in 1989 in Utah, and the animal was formally described in 1998. The name honors a paleontologist named Rob Gaston who owns a dinosaur replica producing company (Gaston Designs, Inc.) in Fruita, Colorado. Gastonia, and all its closely related cousins are most famous for their armor. The spikes and plates that helped protect this heavy and probably slow-moving herbivore certainly made it difficult for a predator to easily attack. The heavy defense allowed Gastonia to use its toothless beak to munch on low-growing plant material without having too much worry about attacks from would-be predators such as Utahraptor. Gastonia, like all nodosaurs, was covered in osteoderms, which are bony deposits that sit in the dermal layer, or skin, of an animal. These certainly gave the animal quite a bit of protection, but Gastonia also featured a large bony plate on its back, and a number of bony spikes that were presumably on its side and back. These were covered in keratin, which is a common protein that many animals have covering bony horns. 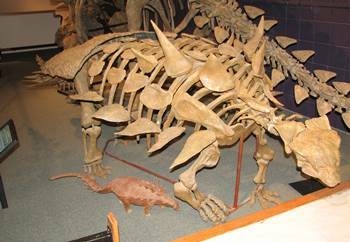 These vertical spikes would have been a very unwelcome sight for a potential predator, and although nodosaurs like Gastonia lacked the bony club tail that its more famous cousin Ankylosaurus wielded, it is probable that some of its spikes were lined up horizontally on the tail which Gastonia could swing to great effect. Although we know quite a bit about Gastonia, the newly discovered nodosaur will help answer many questions about this interesting dinosaur family since the fossil is so well preserved compared to the vast majority of nodosaur fossils. Because it was found in a fully articulated position (although only the first half or so of the animal was found) with skin impressions, osteoderms and spikes still attached, scientists will now have a much better understanding of many aspects of these dinosaurs, including how their bodies were arranged. 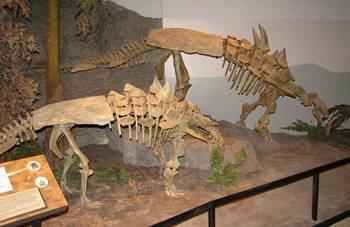 This entry was posted in dinosaur museums, dinosaurs, Fossil of the Month, Natural History Museums and tagged dinosaur museums, dinosaurs, Fossil of the Month, Gastonia, Natural History Museums. Bookmark the permalink. I’m going to have to get to Drumheller this year and check that out! I wish I could get there this year, but I’ll probably have to wait a while. What a great fossil! Let me know how it is in person after you visit!